The best kind of beauty is the kind that enthuses effortlessly over a lifetime, becoming less and less about vain definitions, and more about your connection with others. There is no better sort of beauty cultivation: this annual push towards your authentic and truest self, a life long pursuit of wisdom, joy and to be of help to others. 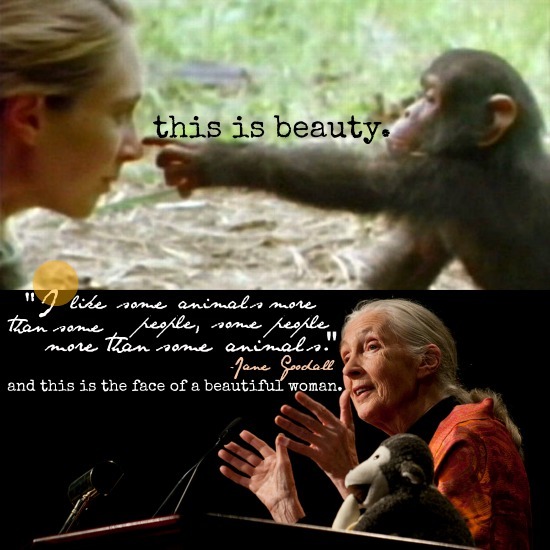 I can think of no better exemplification of a LIFELONG BEAUTY than Dame Jane Goodall. 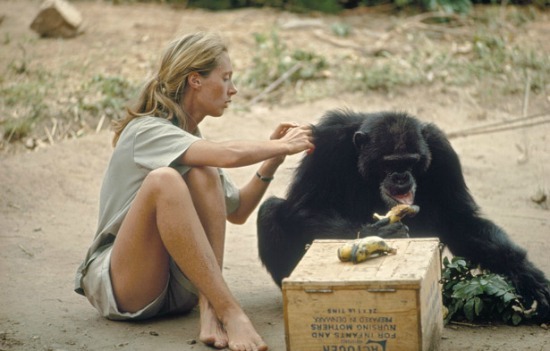 Her passion for animals and Africa started her journey, and her determination to be true to herself aided her in her groundbreaking work and observations. Not one to rest on mere laurels, this one-time college drop-out managed a doctorate from Cambridge University, becoming an accomplished anthropologist, primologist, as well as an animal activist and advocate. She's founded two worthy non-profits. The Jane Goodall Institute helps raise awareness of the plight of the great apes, while Roots and Shoots creates programs for children to actively connect to their environment. I daresay, Jane Goodall had an immense beauty in her youth, but seems even more intensely luminous in her beauty now that's she's in her early 80s. 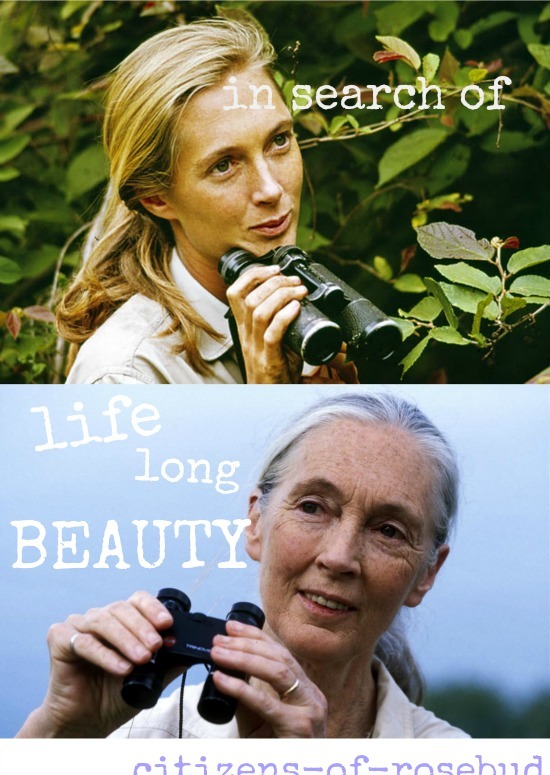 Jane Goodall is my kind of "super model." 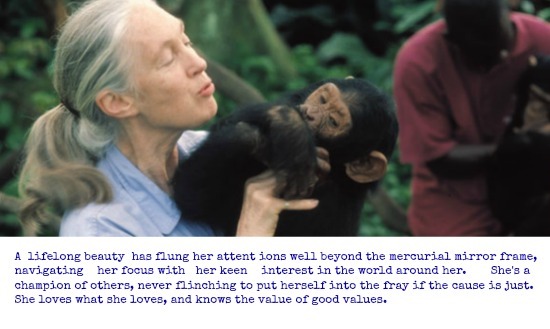 More striking than any creature scuttling across a fashion catwalk, Jane Goodall makes a super role-model as well. This is what lifelong beauty looks like. This is the face of a beautiful woman. True beauty flourishes inside a confident and dynamic woman. A lifelong beauty has flung her attentions well beyond the mercurial mirror frame, navigating her focus with her keen interest in the world around her. She's a champion of others, never flinching to put herself into the fray if the cause is just. She loves what she loves, and knows the value of good values. Beauty grown inward, is the fruition of a lifetime, a gentle but steely deliberate cultivation, and no happy accident of nature. Grateful for whatever good fortune she has mined, a true beauty owns her circumstance. Inward beauty's gaze grows outward, and leaves no small mark on the world at large. How you define beauty alters the way beauty affects your world. Where you place your attention on what is beautiful, changes the way beauty is treated in your world. Who and what are your definitions of beautiful? You! Bella who writes like an angel, and stands for causes like secondhand clothing, and locally made. Totally agree! Of course, I think being able to pursue your passion helps make someone beautiful, and I wish that for everyone. Yes, happiness, harmony, genuineness and kindness are truly beautiful, and she is a beautiful lady!